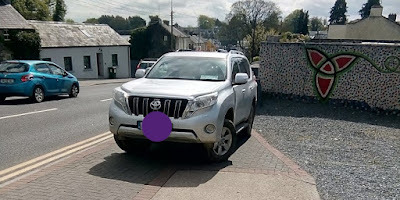 Ummm ... the latest example of thoughtless (and illegal) parking in Kilcullen, this time near Hillcrest. Sure, the driver avoided parking on the double yellow lines, but anyone trying to pass with a buggy would have to step out on to a busy road. Just thinking, one of the ideas for Kilcullen 700 is to produce a calendar for the year. At this stage we have enough pictures of this kind of thing to provide a Bad Parking Calendar ... with the registration numbers not covered.